The idea of color coding heddles pops up in various weaving discussions from time to time. It always seemed like a useful idea to me, especially if it helps prevent threading errors. Most recently, it came up on the Yahoo Weaving list, so I took some notes and decided to give it a try in preparation for my next S&W sampler. Materials for this are super simple. The consensus seemed to be to use acrylic paints, so I got the cheapest ones I could find at my local craft store. The only other supplies were water and brushes. I mixed a bit of the paint with a bit of water and started by dabbing around the heddle eyes. I can't tell you how tedious this quickly became. I wasn't sure how many texsolv heddles I actually have, but with 8 shafts, I knew that it was a bunch and that this was going to take a long time. A very long time. Being the impatient sort Having a long list of things to do that day, I decided that my time would be more efficiently spent if I tried Cerita's idea. 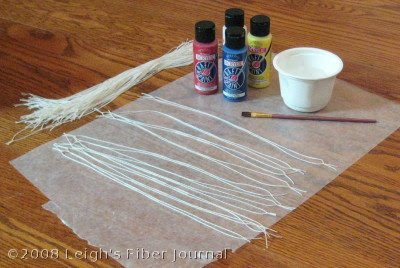 Her method involved diluting the paint and soaking entire heddles in the mixture. I don't have a clue as to the ratio of water to paint that I used. Some colors seemed to stick better than others, so I would add another squirt of paint depending upon how the heddles were looking at the moment. Here's what they look like on my loom. I left the heddles on the first and last shafts white. I used six other colors for shafts 2 through 7. Since then I've threaded my S&W sampler warp and it was so much easier to pick out the next shaft in the threading order! I like texsolv, but the heddles are pliant so it's sometimes difficult to tell exactly what shaft a particular heddle is on. My other hope is that this will help when I need to adjust the shed. Again, it's sometimes difficult to tell what shaft an incorrectly threaded warp end is threaded on. Color coding the entire heddle should help with that too. Next is tying up the treadles and then I'll be weaving. Cally has started on a summer & winter adventure as well, and her results are inspiring. I'm anxious to get weaving too. 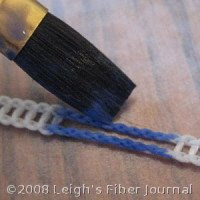 For a few more ideas on how to color Texsolv heddles, check out the comments at the end of this post. That's a fabulous idea - you come up with the best suggestions. I'll save it for later - my current loom has only four harnesses, so not as confusing, and has wire heddles anyway. I did something similar, lazy me did it with permanent markers, it was quick and I did not have to take them off the loom. Yours look a lot prettier. Leigh, I am so glad my idea worked out :). 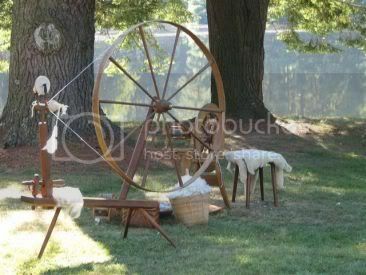 I will be doing it all over again soon, as I have just sold my table loom and now have a Leclerc Fanny counterbalance. It has wire heddles, which I really don't like! I am going to be converting them all to texsolv. 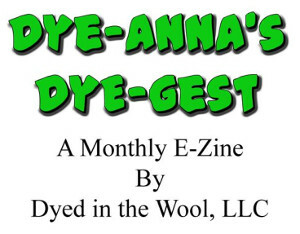 So, will be "dyeing" about 800 of them LOL! The other option I am thinking about it using Pebeo's ink, but it's a more expensive one than the acrylic. I love coloured heddles, it really makes threading them so much more easier! Brilliant, Leigh! Any bright ideas for color coding stainless steel heddles!? Very pretty! I'm sure this will speed up threading and help avoid errors, but will be interested to hear how much difference you find it makes. 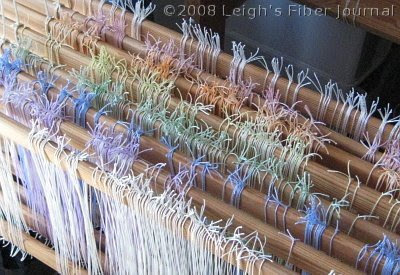 How beautiful they look on your loom! I have large-eye wire heddles on my loom. In order to see them I painted above and below the eye where the twisted wire part of the heddle is. And, every 10th heddle I painted around the eye as well. It took a few days to do all the heddles, I put two coats on them, but they are really easy to see, now, and they look pretty too. Nice! Though I think I will have to wait until I have more heddles though since I still anticipate switching them from shaft to shaft. I wonder if a dab of white out or nail polish would do for metal heddles? Say, on every other shaft? You have the most lovely heddles I have ever seen. Now, how often have you received that compliment?! I still can't get my mind around what weavers call Summer and Winter. Can you refer me to a simple resource - really simple? I completely understand Color and Weave - may just stay there since it's a comfort zone for me. 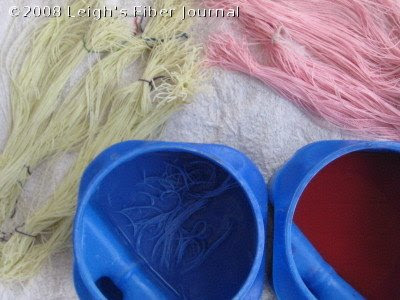 Do you notice any kind of stiffness because of the paint on the heddles? It looks like the answer is no, due to the diluting of the paint. I appreciate all the comments! Plus Connie's question about color coding steel heddles. I wondered the same thing when I had my Schacht Mighty Wolf, so I've enjoyed all of your suggestions. I hope they will be useful to someone with steel heddles. Sharon, so far I'd say that Sharon Alderman's Mastering Weave Structures has the best explanation of S&W that I've read so far. (Now you've given me the idea to do a post on S&W books and resources.) Her explanation is beautifully simple. Patrick, that's a good question. I haven't noticed any difference in the stiffness of the heddles, but I suspect you are correct that the dilution is the reason for this. The only "problem" I've had with this method is that the paint didn't cover the heddles evenly, so that some of the eyes aren't well stained. This defeats my purpose, so I suspect that eventually I'll re-do some of them. It looks so pretty! Great idea! What a great photograph of those beautiful heddles! You are always a great source of information!